Wow. I'm suddenly feeling like such a complete wuss with my <20kg lift 1x15 combo! I need to man up haha. ^That's impressive! I wonder if Ford designed it to fit an 8x10. We used to have a Suzuki swift 5 door hatch. 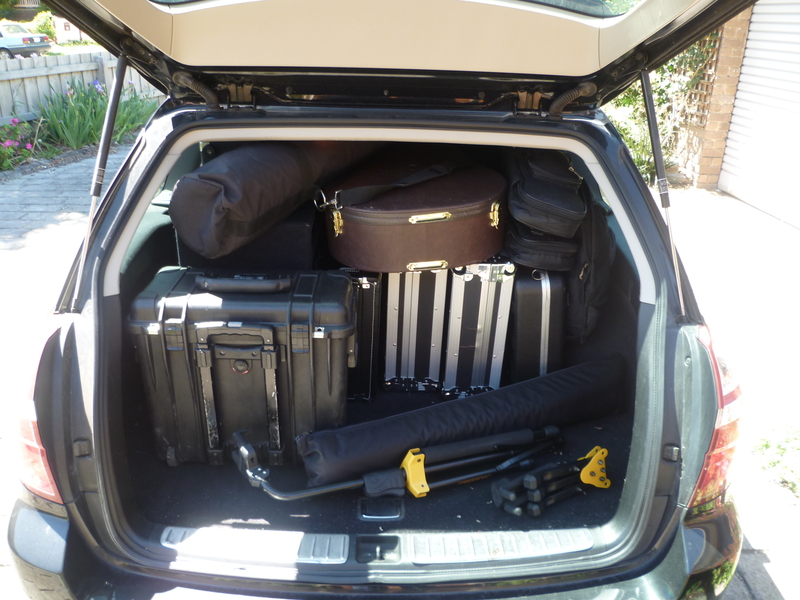 I could fit 2 upright basses in the car. Small hatchbacks are awesome. Same here with a Honda Jazz, not lying when they call them magic seats. Was much better when I didn't use the back seats to flip them down easily as they were always clear, an easy lift in through the boot for my dodgy back too with the little neoprene mat that allows easy sliding in and out with no bumper/moulding damage. Which small wagon/ hatch can fit the most gear. I gotta a half decent wagon - but am super impressed with what some of you guys fit into those smaller cars - nice. This was a pack for the 2011 Melbourne GTG. 7 solid body basses, 1 EUB, 1 acoustic, a 212 cab, stands, 2 amps I think. Subaru Wagon. I don't recollect what happened to that pelican box. I went looking for it a little while back to take some stuff to QLD and couldn't find it. It might of gone to work with me and been borrowed by one of my techs. I don't mind if it gets derailed a bit. Forester seems to have a much more practical internal space than a lot of the wagons these days. All the curves and bumps on the outside cut down a lot on the internal space. ^^ Yep we have a forester and a VE wagon. Loads more room in the Subaru. I've got a NV610 and a NV115. Keen to pick up another 15 for the modular comparison. Have you looked at a Barefaced 610. Can handle up to 1500w and weighs under 30Kg. That's interesting. I ended up getting a VF SS Wagon last year and parting ways with my VY wagon. I'd done the research, I knew how much less capacity the new wagons had. My Fender 610 could fit on it's side across the back of the back seat in my VY, in the VF I am putting the seats down to get it in. According to Fender website it's actually 43kg. Having said that, mine definitely doesn't feel that heavy. I can lift it with one hand (not that I choose that method of loading it into a venue or anything). For me this is the perfect bass cab - heaps of bottom end clarity, adjustable tweeter, skid rails, wheels, super light and fantastic tone. Hey everyone, I’ve only just seen this thread some great input here and love the talk about what can be fit in the back of our cars. That could definitely become it’s own “post your” thread! The barefaced looks awesome and is on the list. It’s just a lot of $ to get it over here so trying to explore other options before I follow through with that. Yes the fender comes in heavier on their specs but good to know it seems lighter in the flesh. Hopefully a used one in Brisbane comes up that I can actually have a go at moving around. Also with NAMM on right now, I was hopeful another manufacturer may come out with something new! I love my berg CN210....imagine a neo NV610....! HDN610? This is the latest on my GAS list. Same depth and width as my HD212, and extra 5cm taller, which is a good thing being closer to the ear. Only 29kg too, so even easier to get into the back of the hatchback. Haven't yet experienced a sealed cab. If only I needed that much power.